There is something about Kolkata that causes you to become fully awake at every level. This is especially true for those who visit this humanity-congested city for the very first time. Kolkata jars them awake like a strong whiff of smelling salts. There is nothing boring about Kolkata. No matter where you turn, there is always something to engage your senses or to challenge you to think. It’s impossible to walk down the filthy sidewalks past those who live and sleep on the streets without feeling something in your gut. The assault of images like these can be overwhelming and will linger long into the night as you drift off to sleep and then, they will be here waiting for you when you get up in the morning. You can try to ignore what you see, but it’s hard. You have to think about and process the sights and sounds and smells to try to make some kind of sense of it all. 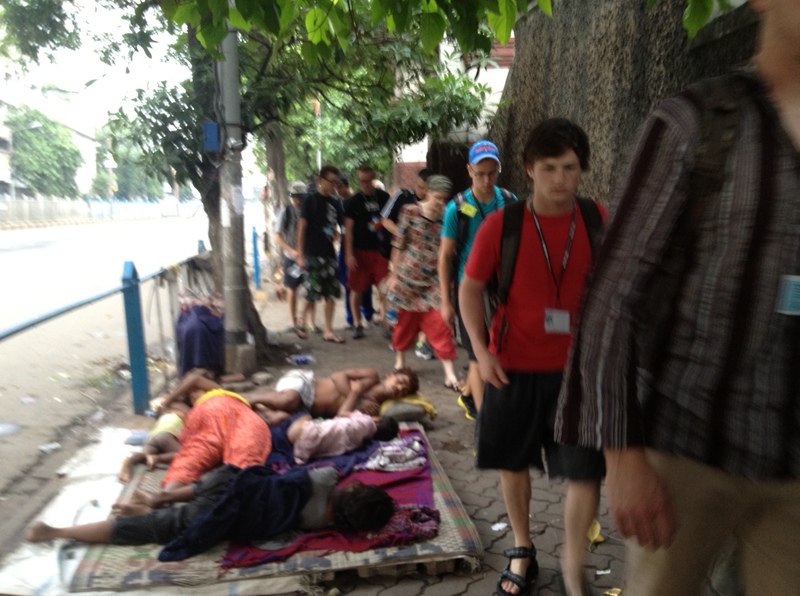 This is Kolkata — a city that is home to what seems like every poor and desperate person on the planet. I think I understand why Mother Teresa chose this as the place to launch her ministry to the least of these. This morning our students were jarred awake in yet another way. I invited my friends from the local International Justice Mission field office to talk to our students about human trafficking. The presentation was gut-wrenching and challenged our students to come face to face with the global problem of trafficking in people. I especially appreciated that the presentation was interactive and that our students had to break into small groups to discuss, process, and pray about what they had learned. As I walked around and eavesdropped on these groups I was moved by their passion, prayers, and tears. This generation understands that they cannot ignore or walk away from what they have learned. They must act and take ownership of the problem and, at the very least, address it in their own prayers. William Wilberforce said, “You may choose to look the other way but you can never again say that you did not know.” He was right. The problems of poverty and injustice are not going to go away. However, we can make a difference if we will choose to get involved at any level. Each generation must take responsibility for doing what it can to champion the rights of the oppressed and then must prepare the next generation to do the same. Living selfishly and ignoring the problems is an option that I hope neither we nor our students will choose. We must act as though the one in need of help were Jesus Himself. As Mother Teresa often told others, we must look for Jesus in the distressing disguise of the poor and the oppressed and then do for these what Jesus would do. That’s advise that each of us should follow. It’s been a good day in Kolkata. Our students have seen and experienced a lot of things today. We concluded our day with a time of worship and then, off to bed to rest for our first day of service at Mother Teresa’s homes. Serving at Mother Teresa’s homes will certainly be another experience that will challenge our team to think deeply and act compassionately. And — that’s a very good thing. Praying for all of you! May God bless your service. 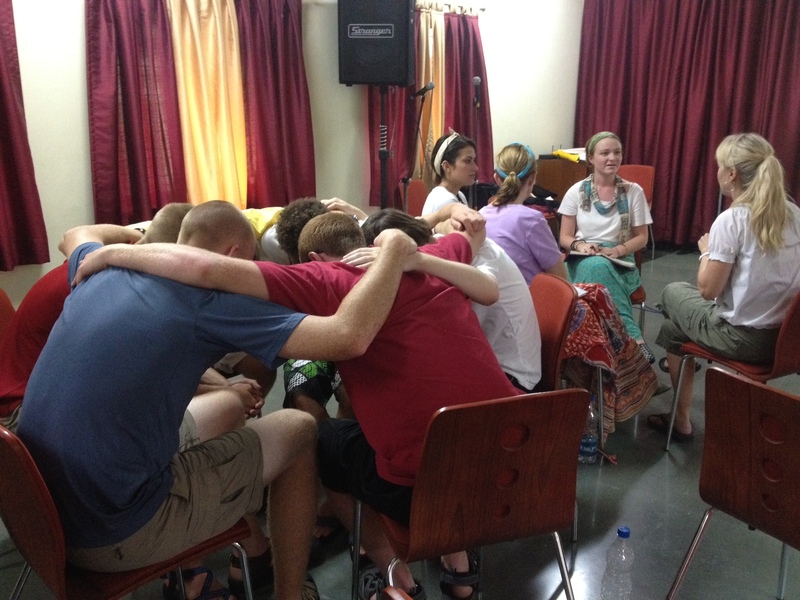 Thank you for living selflessly and not only leading these kids to India but teaching them and helping them grow spritually as they grow more aware of the world around them. As you minister to those in India your writings minister to me. So thank you, to you and to every leader with you who gave up their time and put their lives on hold to travel across the world to serve our Lord. My prayers are with you everyday. Thanks for your kind and encouraging words, Shelly. It is a privilege to be in Kolkata with our students. Really great team!